This entry was posted on 19 April 2013 at 4:00 pm	and is filed under Solving Blogs. You can follow any responses to this entry through the RSS 2.0 feed. You can leave a response, or trackback from your own site. 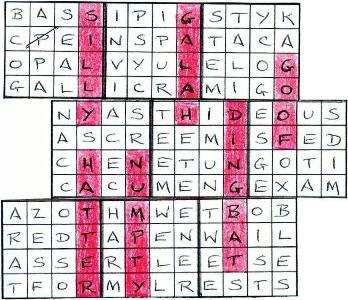 Mark Bull is very welcome to write a guest blog at George vs the Listener Crossword anytime! Thanks for cracking me up. George, glad you were entertained. However, I suspect that letting the Bull loose on our blogs would be far too stressful for both of us!